The Baikal basin is a unique area that draws attention of tourists from all over the world. Its location in the heart of the Eurasian landmass has defined its high ethno-cultural and natural diversity. The history of development of the lands around Baikal is connected with the rise of two giant empires – Mongolian and Russian, as well as with the historical development of trade and transport routes. The natural and resource nucleus of the recreational system of the Baikal basin is the oldest and deepest lake in the world itself. Infrastructural centers for tourism development are major cities of Ulaanbaatar, Irkutsk, and Ulan-Ude. They play the role of major international transport hubs and have administrative, educational, and cultural tourism resources, as well as a significant hospitality potential. In 2012, Ulaanbaatar had the largest hotel fund (over 170 hotels). There were about 80 hotels in Irkutsk and up to 20 in Ulan-Ude. 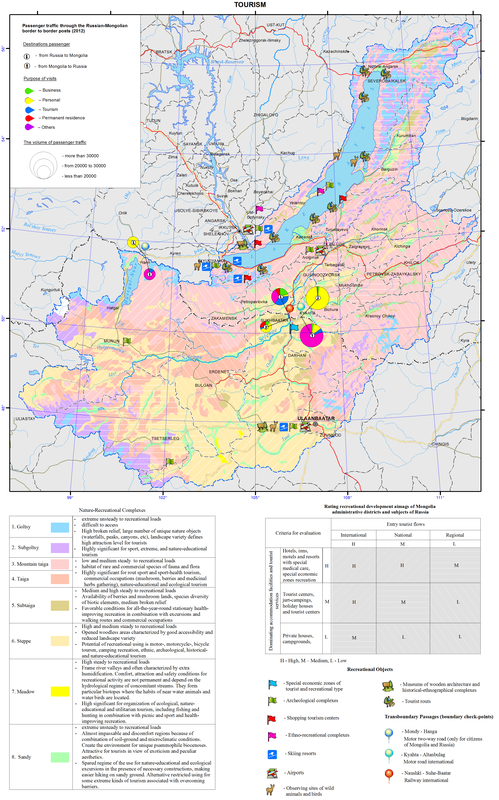 In general, the transboundary area of the Baikal basin has over a thousand places for tourist accommodation of general and special purpose (Fig. 1). The number of accommodation facilities, as well as the level of offered services in conjunction with the configuration and nature of the tourist traffic help identify the most important areas for the tourism industry, assess the degree of tourism development, and get a general picture of a territorial structure of recreational activities. A matrix integrating the character of tourist traffic and a predominant type of accommodation was used as the basis for the expert assessment of tourism development of administrative units of Russia and Mongolia. The main distinctive characteristics of the recreational system of the Baikal basin is its transboundary position. Therefore, the neighboring aimags of Mongolia and administrative districts of Irkutsk oblast and the Republic of Buryatia that are located along the state border and have cross-border corridors (ports of entry) are of a special significance. The process of development of cross-border tourism in the neighboring territories of Russia and Mongolia is taking place under conditions, where both countries with a unique culture and nature are an integral part of the international recreational space, have a special interest for tourists from other countries, and make mutual contribution to the formation of the inbound tourist traffic. The Russian-Mongolian border, which crosses the basin, has three checkpoints that not only facilitate the exchange of foreign and domestic tour groups, but also serve as a prerequisite for the development of cross-border trade. Within 10 years, the total volume of passenger traffic through the existing checkpoints has more than doubled – from 229 thousand people in 2002 to 502.5 thousand people in 2012 (Fig. 2). Development of cross-border tourism requires joint decisions to promote a common tourism product on the state level. Such projects as “Baikal-Khovsgol”, which connects two great lakes of Asia, and “The Tea Road” have already become popular. The establishment of transboundary special protected areas have great prospects for the bilateral cooperation in the field of eco-tourism. They represent a particular organizational resource, which is important not only for the resolution of shared environmental problems, but also for the coordination of efforts aimed at implementing cross-border tourism projects. Active cooperation between Russia and Mongolia in promoting tourism within the unique natural object – the Baikal basin not only opens the possibilities for increasing inbound foreign tourism in both countries, but also contributes to the expansion of similar relationships with other neighboring countries, such as China, Kazakhstan, and Japan. Statistical Compendium. (2012). Business of the Angara region: Tourism and hospitality. Irkutsk: Irkutskstat. p 35-62. Statistical Compendium. (2011). Activities of tourism firms and collective accommodation facilities in the Republic of Buryatia in 2011. Ulan-Ude: Buryatstat. p 7-12. Statistical Compendium. (2012). Culture, tourism, and recreation in the Angara region. Irkutsk: Irkutskstat. p 45-52. Statistical Compendium. (2011). Tourism in Sunny Buryatia. Ulan-Ude: Buryatstat. p 59. National Statistical Office of Mongolia. (2013). Soyol, sport, ayalal, zhuulchlalyn salbaryn lavlakh. Ulaanbaatar. p 285. National Statistical Office of Mongolia. (2012). Mongolian statistical yearbook 2012. Ulaanbaatar. p 297-299. National Statistical Office of Mongolia. (2007). Mongolian statistical yearbook 2006. Ulaanbaatar. p 265-269.